Cities and private companies that bill for recurring usage, metered and flat rate. A comprehensive utility billing and CIS toolkit, our cloud based software is used every day by over 200 municipalities and companies in 3 countries. MuniBilling can be used to bill for any type of service or fee, allows for unlimited rates and tiers, and boasts integrations with automated meter reading systems, accounting packages, GIS software & much more. A MuniBilling subscription comes with access to hundreds of features and workflows, frequent enhancements, and unlimited customer support. Pros: We have a very specific and unusual need for billing. We operate a thoroughbred training facility and we rent by both stall and barn. 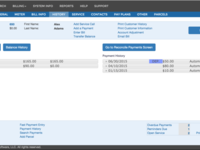 There is a wide variety of billing accounts that come into play throughout the month. When we needed a desperate upgrade from a previously customized program to something else that would work for our needs, MuniBilling provided us with the ability to customize and create something that carried the same elements as what we used previously. Cons: Because we were trying to keep it as similar as possible to a previous program, there are several parts that require individual processes to complete. While this is not difficult, it does create more opportunity for human error to mess with the system and no way to fix other than an adjustment. I wish it had a better editing option. Overall: We started with the support staff who worked with us to program MuniBilling to our needs and then acted as our account manager for some time. When he moved on, the other one took over and didn't miss a beat. I have always been very, very happy with the service and appreciate all the help that we have received. I look forward to working with him more as we continue. Pros: I left an outstanding review of this product in 2013 after having used it for 1 year, however. Cons: Now for the howevers.Control of MuniBilling has apparently been sold to investors who seem to have no direct knowledge of billing software or of utility systems in general. Where we once could contact the owner/developer on his cell phone, we currently have no knowledge of who is commanding the ship, or whether we will even receive a response to a customer support ticket. Originally, the developer was making almost weekly improvements to the system, adding this or that. We could even ask for customization if desired. Now, afte r 6 year's of use, the company has apparently grown to the point that everything is just shoved down our throats. I requested that a 3 word phrase on our bills be changed to the same 2 word phrase which had previously been used , and was told that it wasn't possible. 2 days ago we received an email telling us that MuniBilling's payment provider was discontinuing all utility's ability to accept integrated phone / field-entered credit card payments for security compliance reasons. This change was going to take place in less than 2 weeks and we were warned that we should get the word out to our customers quickly for a easy transition. When I called the payment provider, the rep knew nothing about any such change. They are setting us up a new card processing account, separate from MuniBilling's account. The surprises and removal of necessary features by an ever-changing management team, over the past year, continue an undesirable trend. Pros: This cloud-based product is very user-friendly and works exceptionally well for us to bill utilities across numerous apartment communities. We reviewed a number of different products before we selected MuniBilling and are certain that we made the right choice. 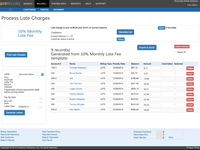 It's capable of handling a variety of complex rate structures and all of the unique aspects associated with billing Multi-Family properties. In addition, their customer support team has been fantastic and there for us every step of the way! Cons: As with all 'off the shelf' products, there are some limitations on customization and configuration. With that being said, we haven't encountered anything that we haven't been able to work around. 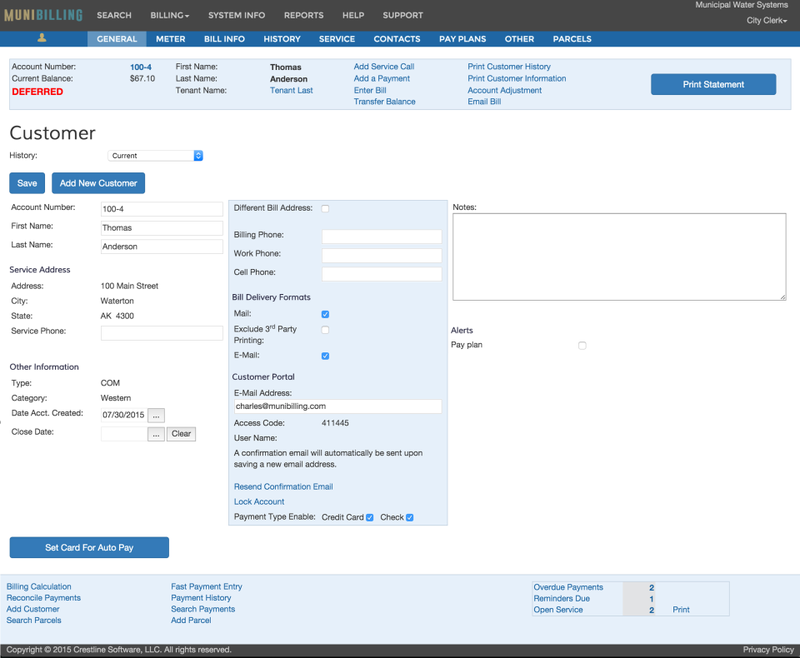 Overall: This is a highly capable utility billing product with great functionality, ease of use and strong customer support. We came onboard with MuniBilling in 2018 and it's been a smooth transition every step of the way, thanks to their outstanding staff and customer support. Pros: How it is user friendly. Customer service is always available if you need them and almost always has an answer or will call back in a bit with an answer. Cons: I can't think of anything that customer service hasn't helped me solve. Overall: Billing is excellent. 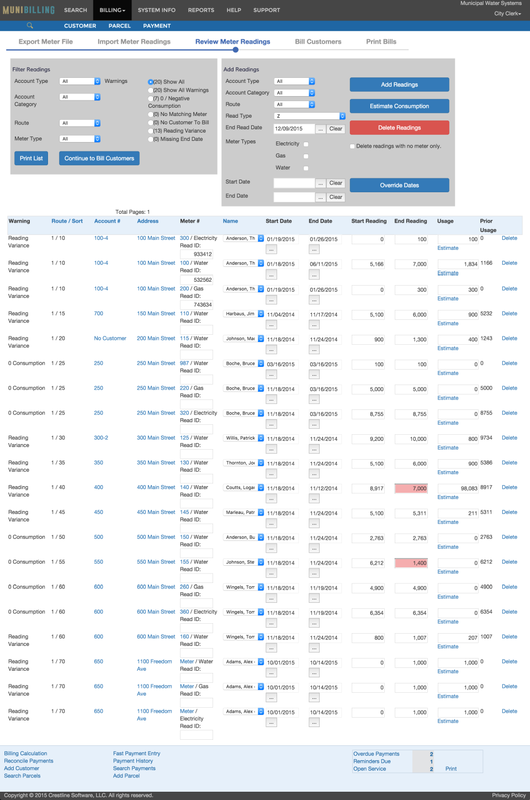 We can custom our billing to meet trending changes. Again with just a bit of help now and then from customer service and voila I have everything I need...... bills, reports, ect. Pros: Reporting structure is very good and is always improving. Cons: I don't use the accounting features or accounts receivable module so I can't comment on that. It did take some time to get everything setup as this university has some very odd situations. Overall: We can stay on top of all the meters we have on campus and the easily modifiable route reports are top notch. Munibilling was able to implement new strategies in metering. Pros: User friendly and great customer support. Cons: Wish there was an advance search. Instead, I'd have to search through reports, export and minimize to locate what I'm searching for. Pros: We are a small utility company handling the utilizes for a local Indian Tribe. We love the flexibility and ability to use the system from any location and how the tribes members can access their accounts and look at their monthly usage. Cons: Our business is complex, so it isn't anything about the software that is a con, just a con in trying to fit our unique situations into 1 system. Overall, though there aren't any cons that would cause us to regret using the software. Overall: Overall, we're very happy with the ease of the system, how quickly we're able to enter our utility reads/bills and payments into the system. We're 1 entity with three unique utility entities under it. And having all of those in 1 software program has been a game changer. 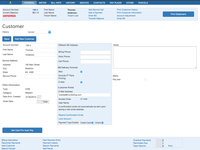 Comments: My Municipality has used this software for the past few years and I have yet to see one con in the ease of use, customer service, or overall quality of the system. Online billing software allows a company the ability to store and easily access customer information, billing, and payments with ease from any location and the security of backing up everything online thereby eliminates the need for an additional an backup system. The Customer support is amazingly quick and efficient. The staff is extremely knowledgeable and willing to help guide you through any obstacles you encounter even years down the road. I would never recommend another billing software to anyone! 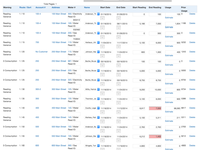 Munibilling is an overall EXCELLENT system! Comments: Whe had been looking for a billing solution for our small water utility for quite some time. We definitely found what we were looking for in MuniBilling. The system has everything and more than we thought possible. I have never had the good fortune to deal with a customer service team such as this one. We can literally make a suggestion ar ask for an upgrade and it will undoubtedly be ready to use within a matter of days. These guys are absolutely great. No way could we have been fortunate enough to run into a business such as MuniBilling, with everything we wanted in a billing solution, plus a whole lot more, and all at an unbelievably low price. Comments: We switched to MuniBilling after the software we were using no longer fit our needs. The transfer of customer account data was handled by the MuniBilling team with meticulous attention to detail. The technical support provided is outstanding. We are a small municipality but they are never too busy to spend whatever amount of time it takes to help us resolve an issue or walk us through the steps to accomplish a task. 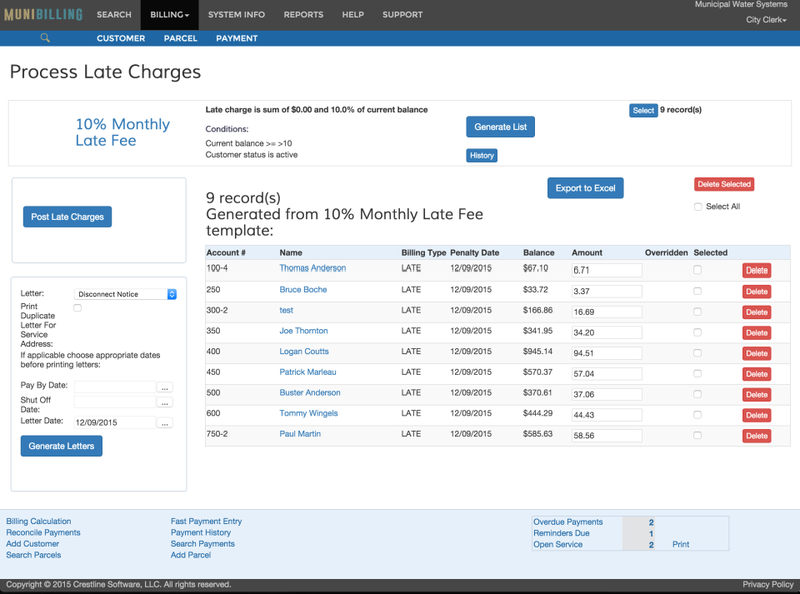 Our customers are now enjoying the benefits of a superior utility billing software. Comments: If you are searching for a Utility Billing program for you, you have found it. This company has a great program that is easy to use. You will find that their entire staff is beyond outstanding! You call them with any issue and they will fix it right away. Got special needs for your organization? No problem for them, they will change the program to fit your personal needs. You can't go wrong with this company, and I think you be happy once you join with the rest of us! Comments: Munibilling has been very good to work with. The transition from our old Utility Billing went very smooth and the staff at Munibilling were very helpful. We have been using Munibilling for a year and have been very satisfied with the product and the company. The staff is very helpful and patient with me as I learn the program. 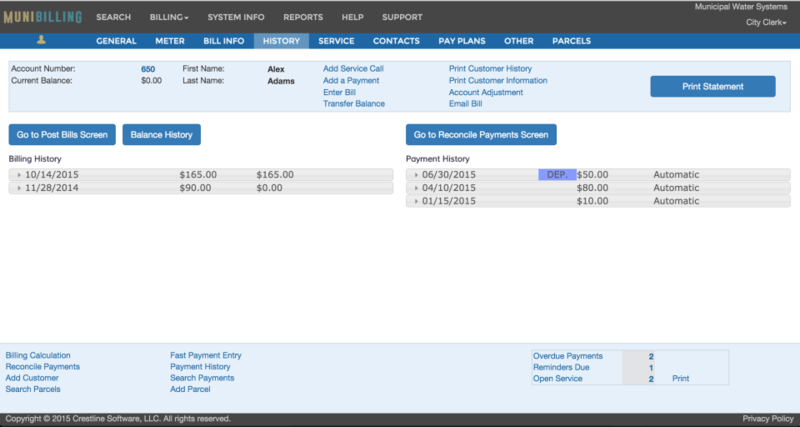 This is the 3 Utility Billing Program I have used in the last seven years and it is the most user friendly. Pros: I like the software. I like the setup of the billing. Very easy to read and understand. Cons: I liked the software. It is hard to say what I didn't like. Overall: The customer service was very helpful. Maybe because of it being the first time there were alot of errors on the registers. The bill seemed to be correct except for a few. Comments: Munibilling has been wonderful for us! It is extremely easy to use and the customer service could not be better. Any questions or problems I have experienced with the website have not only been corrected but answered within a timely matter. Comments: Customer Service is exceptional.